How to play bridge? The bridge rules explained. Bridge is a card game played with 4 players divided into 2 teams of 2 people each. The teams are also called "pairs". The players sitting across from each other at the same table form partnerships as North‑South and East‑West. To play bridge, you need a deck of 52 cards. Spades and hearts are major suits. Diamonds and clubs are minor suits. After the dealer distributes the cards, each player has a hand of 13 cards. A bridge deal consists of two phases: bidding and card play. In this phase, players bid for the minimum number of tricks they think they can take to win the deal. The dealer makes the first call. He is the "opener". Then the auction proceeds clockwise. There may be several bidding rounds. The bidding ends when three players in succession say Pass, meaning that they do not want to bid higher. The final bid becomes the "contract". A number from 1 to 7 called "level". A suit (spades, hearts, diamonds or clubs) or "notrump" (NT). The number refers to the total number of tricks (six plus the number indicated in the bid) one pair has contracted to make. The suit indicates the trump suit. For instance, the North-South pair has bid 4H. It commits to making 10 tricks with hearts as trumps. If a player thinks that the last bid made by one of his opponents is too optimistic, he can double it when it is his turn to speak. This double can be redoubled by an opponent. The purpose of bidding is to relay information about the strengths and weaknesses of your hand to your partner. It will help you determine the easiest contract to make based on your respective hands. It is therefore important to know the meaning of each bid. This is referred to as "bidding systems and conventions". Once the bidding is over, the play begins. Here the aim is to win tricks equal to or more than the number bid. The "declarer" is the player who first mentions the suit or notrump that becomes the final contract. The "dummy" is declarer’s partner. The opponent team is on "defence". The player to the left of the declarer starts the play by making the "opening lead". He names the suit and the other players have to play a card in that suit if they have one. Otherwise they can ruff with a card in the trump suit or discard any other card. After the opening lead, the dummy places his 13 cards face-up on the table and his partner calls the cards during the play for both hands. Whoever has played the highest card in the suit wins the trick and leads any card in any suit desired to the next trick. In a trump contract, if a player doesn't have a card in the suit led, a trump can be played. In that case, he takes the trick unless a higher trump card is played by someone else. At the end of the deal, if the declaring pair takes the number of tricks (or more) it committed to in the initial contract, it scores a certain number of points. But if it doesn't make its contract, the other pair score points. We have put an online tool at your disposal to help you count your points in the "scoring" phase. Now that you know the basic principles, why don't you get started and play bridge online with Funbridge? 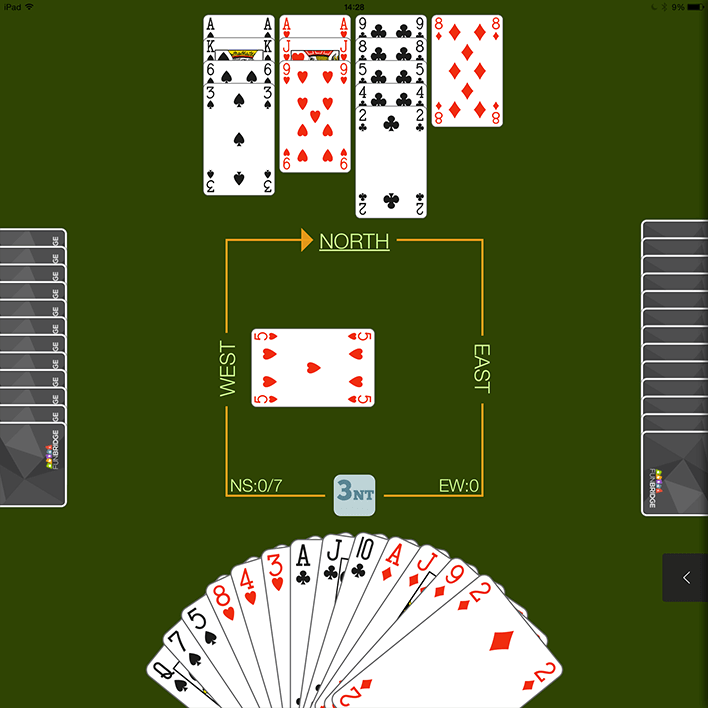 Funbridge is an online bridge app allowing you to play bridge for free wherever and whenever you want. 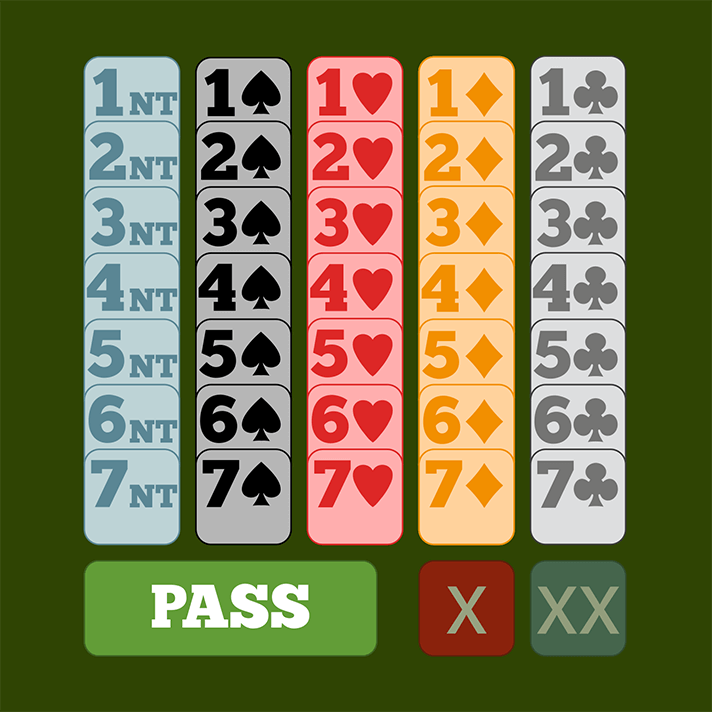 One of the main advantages of this bridge software program is that you play bridge against a computer, which is available 24/7 to play bridge as much as you wish. To make sure all players are on an equal footing on Funbridge, they play the same deals with the same cards. This is referred to as "duplicate bridge". Here the key to beat the other players is to be the best at the play of the hand. Which conventions do you like most on Funbridge and why? I play 5-card majors and weak NT with most of the usual gadgets, Jacoby 2NT, RKCB, Michaels etc. It pays to check the responses etc, as they are not always as expected, ie Funbridge robots don't play things as I'd expect my partner to do! Basic otherwise the robots bidding becomes even more outlandish. I just use the beginning conventions so far.